Just how many times will I have to practise Uttanasansa before it becomes effortless? And yes, every day it does feel as if I have never practised in before but that of course, is why I need to do it. Welcome. There's probably two reasons why you've come to this page. Either you are curious and that's fine or you experience regular back pain which is not so good but there is hope for you! For people who have back pain, I'd always recommend that you check with the doctor that there are no underlying medical conditions which need medical help. When you come to me for a back care exercise assessment it takes about an hour and a half. The examination involves checking some of the bony parts of your skeleton and investigating some of your muscles capabilities. At the end of an assessment, I may recommend you visit a chiropractor or an osteopath because it is obvious the pain you are experiencing is linked to a bone having gone walk abouts. It happens. It happened to me when I had been given a horse to hold and the horse decided to rear. My pelvic area was twisted a bit and if it hadn't been for yoga I wouldn't have been able to cope. Years later a visit to an osteopath and a click here and there and my pelvis was back in line and the difference was amazing. However if it's the muscles that are probably causing you problems and poor posture, we'll work out an exercise plan that you can follow for a few weeks. For most people once they have the hang of these back care postures (which always look so simple and as if you are not doing anything but which always make me work harder than most exercises I know! ) it doesn't take long to want the next step up in the exercise world. And yoga is the perfect next step up. Contact me if you wish to arrange a back care exercise assessment session. 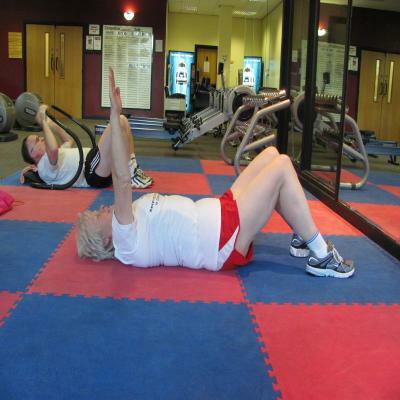 The picture is the Dead Bug exercise where all the emphasis is on finding your core muscles.